Owing to the increase in the number of mergers and acquisition strategies, the global market for laminated labels is expected to generate great revenues in the years to come. The competitive landscape of the laminated labels market is anticipated to be highly intensive in the coming years because of the rise in the number of players. The increase in competition level amongst players may be attributed to the technological advancements and the development caused due to them are factors that can augment the global market for laminated labels. The increasing demand for pharmaceutical supplies and packages beverages and food is among the key factors anticipated to encourage the upliftment of the global laminated labels market in the years to come. There is also a rise in awareness related to the advantages that laminated labels provide when used as well as increase in demand from consumer durables and this significantly adds to the augmentation of the market worldwide. The need for customer engaging, highly resistive, durable and attractive packaging has caused the need for laminated labels in the industry. Laminated labels plays a significant role in marketing products and its impact in the overall industry is noteworthy. Numerous brand manufacturers and owners of end-user or consumer goods are likely to adopt laminated labels because these labels provide high level of receptivity that attracts more end-users towards this market. On the other hand, there has been a noticeable rise in the cost of raw materials required for laminated labels, thus restricting growth. The printing done on the package itself is expensive and this may add to the hindrance of the overall market. However, the emergence of e-commerce industry is anticipated to open up new opportunities for the growth and development of the laminated labels market in the long run. 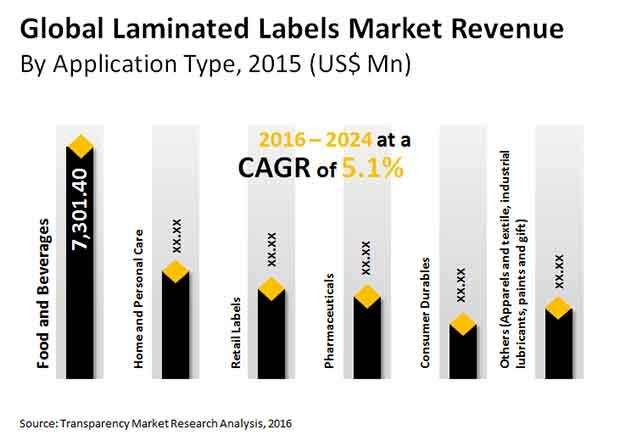 The global laminated labels market is estimated to be worth US$30.97 bn by 2024 with a CAGR of 5.1 %. The forecast period is set to 2016 to 2024 and is anticipated to be increasing by 1.5 times more than the 2015 records which was valued at US$20.02 bn. Food and Beverage Industry to Contribute More Revenue Generation Owing to Specific Application Utilization. The global laminated labels market is segmented on the basis of material type, where the key classifications are polypropylene, polycarbonate, vinyl, and polyester.On the basis of printing technology, the market is categorized into lithography, flexographic, and digital. Based on the classification of printing ink, the global market for laminated labels is segmented into UV curable, hot melt based, solvent based, and water based. End use industry wise, laminated labels market may be categorized into Retail Labels, Consumer Durables, Home and Personal Care, Pharmaceuticals, and Food & Beverages industry. As per the TMR reports, the food and beverage industry, followed closely by home and personal care, is presumed to be attracting more end users as compared to the other end users. The global laminated labels market is studied on the basis of key geographies Latin America, Europe, North America, Asia Pacific, Middle East and Africa. Among these regions, the market in Asia Pacific is foreseen to be among the most favorable ones with regard to generating higher revenues from the incremental opportunities that the laminated labels may provide in the coming years. Europe and North America are also seen to be closely following Asia Pacific showing an overall healthy CAGR graph over the forecast period. Some of the key players in the lamination labels market are Langley Labels, Avery Dennison Corporation, Cenveo, CCL industries Inc, and Hub Labels. The global market for laminated labels has been experiencing significant rise, thanks to the growth in the packaging industry. According to Transparency Market Research (TMR), the opportunity in this market was US$20.02 bn in 2015. Researchers expect it to rise at a healthy CAGR of 5.10% over the period from 2016 to 2024 and touch a value of US$30.97 bn by 2024 end. This market study is a thorough methodical research of the performance of the worldwide market for laminated labels in past and over the period from 2016 to 2024. The study emphasizes especially on the growth boosters, challenges, opportunities, obstacles, and the prominent trends in this market in an effort to determine the pace of its progress. The food and beverage, home and personal care, pharmaceuticals, consumer durables, apparel and textile, retail labels, industrial lubricants, gifts, and the paints industries have surfaced as the key end users of laminated labels across the world. Among these, the food and beverages segment has been reporting a relatively higher demand for laminated labels and the trend is expected to continue in the near future. The usage of these labels is also projected to rise in the home and personal care segment over the forthcoming years. Asia pacific, the Middle East and Africa, North America, Latin America, and Europe are the key geographical categories of the global market for laminated labels. Among these, Asia Pacific has acquired the dominance and is expected to remain on the top spot in the years to come. The presence of incremental opportunities for the increased generation of the revenue is expected to support the Asia Pacific market for laminated labels over the next few years. The Middle East and Africa is also projected to report a high growth in its market for laminated labels in the near future. At the forefront of the global market for laminated labels are Reflex Labels, Langley Labels, SheetLabels.com, ImageTek Labels, Hub Labels Inc., Cenvo Corp., Constantia Flexibles Group GmbH, CCL Label Inc., Coveris Holdings S.A., and Avery Dennison Corp. These players are focusing on technological advancements and deepening of distribution networks in an effort to strengthen their presence across the global market.